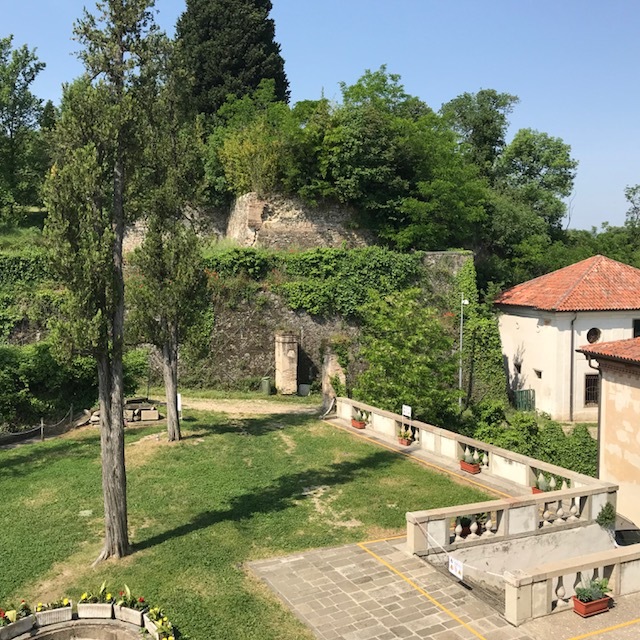 Years ago, when I first discovered the fantastic landscape of Euganean Hills, within easy reach of Venice, I noticed a small ruined castle at the top of a wooded hill known as Monte Alto. It was summer, and a shady walk seemed a good idea, so we parked and walked up the winding strada bianca (unsurfaced track) to investigate. It was abandoned but still more or less intact, surrounded by barbed wire, and I thought sadly that there is such a wealth of wonderful architecture in need of restoration, as is often the case in Italy, that much of it is left to the elements through lack of funds. 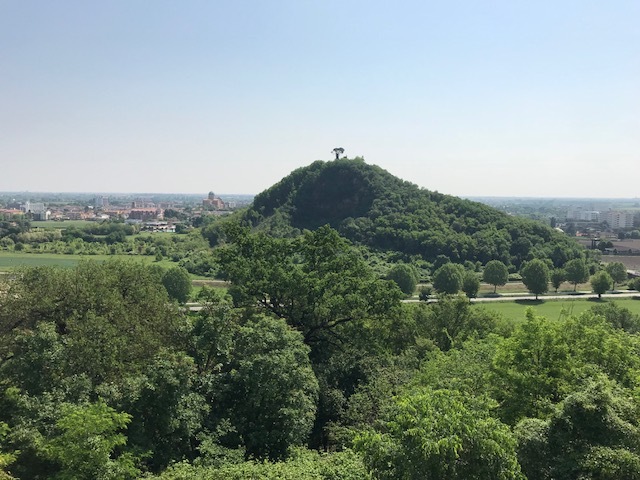 The Regional Park of the Euganean Hills is a relatively undiscovered part of the Veneto, just south of Padua and 40 minutes from Venice by car or train. It has much to offer visitors, from the many extinct volcanoes (good walking and cycling country (don't miss Circular Walks Round Conical Hills) which give rise to hot water springs and hot mud for cures of all kinds; to one of Italy’s top ten gardens at Valsanzibio, the bones of St Valentine at Monselice, and the home of Petrarch, in the picturesque village of Arqua Petrarca. A few years after first spotting the ruined castle, driving along the same road through the hills past Monte Alto, it was this time clearly visible. Scaffolding had been erected, and there was a team of restorers working on the outer walls. It was particularly pleasing to see that this team was all female, skilfully working on masonry, brickwork and plastering. Now, this small castle, known as Villa Draghi has finally reopened to the public, so I went along to an Open Day to learn more. In 1680 Alvise Lucadello, a Venetian accountant, bought the land including a thermal spring and began the construction of a large building surrounded by 133 life size statues on the Villa Draghi’s present site. After his death, his heirs neglected the villa to the extent that by 1843 only rubble remained. A wealthy Paduan landowner, Pietro Scapin, then bought the ruin and its lands to construct a luxury holiday residence, the last of its kind, where aristocrats would move away from the suffocating heat of the city for cooler country air. (The first, not far away, was Petrarch’s house in Arqua Petrarca.). The architecture is Venetian in style, square, with gothic windows and a central pinnacle. It faces towards the east, and looking through the upper floor windows on a clear day, Venice can be seen across the lagoon, beyond one of the conical hills characteristic of the area. The villa reflects the layout of a Venetian palazzo with high ceilings and rooms opening from the central hall on both main floors, a design which kept interiors cool. Scapin had no heirs, and the villa passed to his niece who had married Giovanni Draghi, hence the name of the villa. (Confusingly, villas in Italy are often named after the owners, which means that they can have many different names over the centuries.) 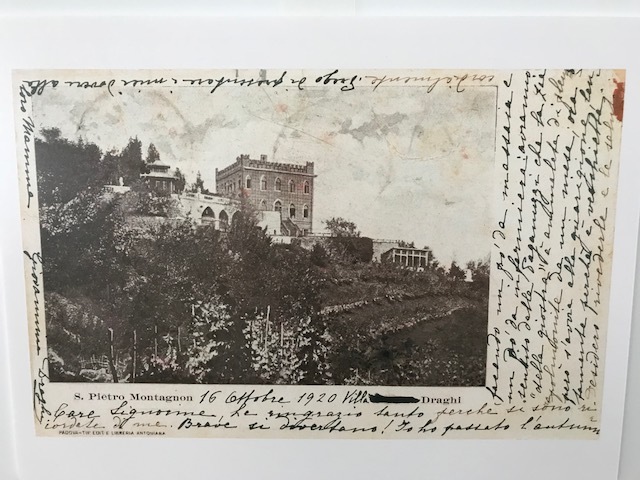 It remained in the Draghi family until 1967, when it was passed to the Jesuits of Venice, who had no real use for it, so they agreed to sell it to the municipality of Montegrotto Terme in 1972, by which time it had been looted and vandalised. Now the villa is empty, apart from modern seating for visitors, and is used for gatherings of all kinds including weddings. The terrazzo floors (speckled marble) have been beautifully restored and the walls are white with new ceilings which carry the heating ducts. My only reservation would be the ugly unsympathetic modern light fittings which have been installed in the side rooms. They are of garishly coloured Murano glass, no doubt hugely expensive, but totally out of keeping with the architecture. And there are no switches, so the whole villa has to be centrally lit if you need to illuminate a room! The Villa Draghi is yet another undiscovered jewel in Italy’s vast array of architectural treasures, in a little green oasis far from the crowds of nearby cities. Villa Draghi is about 8 miles south of Padua just outside the spa town of Montegrotto Terme, clearly visible from the SS250 road. If arriving by car, it is about 2 miles from the Terme Euganee exit on the Bologna-Venice motorway. There is a large car park at the base of the hill. There are direct trains from Venice and Padua to Terme Euganee station from where you could get a taxi or take a short walk of about 2 miles. 26 August 16.00 Dancing in 19thcentury costume.